In the remote village of Gavidia, in the state of Mérida, a very interesting experience is taking place: the rescue of the native potato and other native foodstuffs; something that is fundamental in terms of food sovereignty. In this article we discuss this experience after visiting Gavidia and talking to one of the people involved, Cantalicia Torres. Cantalicia Torres, commonly known as “Alicia”, is a member of the Vertientes de Agua Viva cooperative. It currently has 12 members, a number that has more or less kept constant, Alicia stresses, despite some people coming in and others leaving. The name has to do with the original idea, which remains a goal, of launching a water bottling project, making use of a natural spring in Gavidia. 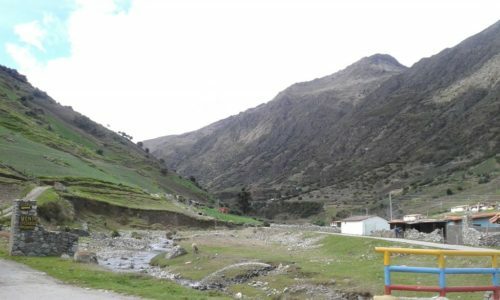 This village is at an altitude of over 3500 meters, and is made up of around 70 families. If we add the two other villages in sight, Micarache and Las Piñuelas, the total is of around 600 people. They mostly survive off of what they produce, and usually need to go down 13 steep kilometers to reach Mucuchíes, the municipal capital, to find other foodstuffs such as sugar or – something Cantalicia stresses as very important – coffee, which cannot be grown at this altitude. We started when professor Liccia Romero came to do her thesis in Gavidia, and Bernabé – one of the founders of the cooperative – enjoys being a “rescuer” of old things, so he used to say that we were not going to let this potato disappear. The main difference is that the native potato yields a harvest every 8 months to a year, whereas the commercial potato can yield one as quickly as 5 months. So since it was less profitable the farmers stopped growing the native potato. The rescue of the native potato is essential in the current context, not just because of general food sovereignty issues, but because, with an economic and commercial blockade, the state has ever fewer resources to import seeds. In the case of the commercial potato (also called granola potato), it comes from countries such as Canada. Additionally, seeds imported by the private sector have unaffordable prices for (small) producers. There are currently eight potato varieties being grown, although many more exist. The differences with respect to the commercial one are not just the frequency of harvests. Cantalicia points out that, while the commercial potato rots fairly quickly, the native one can last up to a year after being harvested. The same holds true for the seeds, which last a long time without rotting. In addition, the agriculture here is much more friendly towards the land. Although the sowing is manual or with cattle, it is biological, without recourse to agrochemicals. Pests are controlled with traps, or with worm humus, produced locally in garden beds, and the fertilizers are also organic, produced using cattle manure. Besides the potato there are other foodstuffs that have being rescued, such as the cuiba, the ruba or the mashua. These are not usually commercialized, but we have them here. 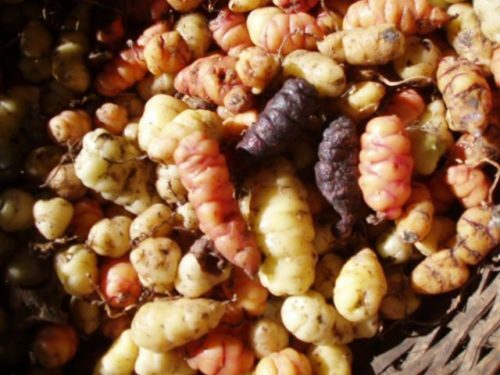 They are native foodstuffs of the Andes that practically disappeared from consumption. Nevertheless, they have excellent nutrition properties. 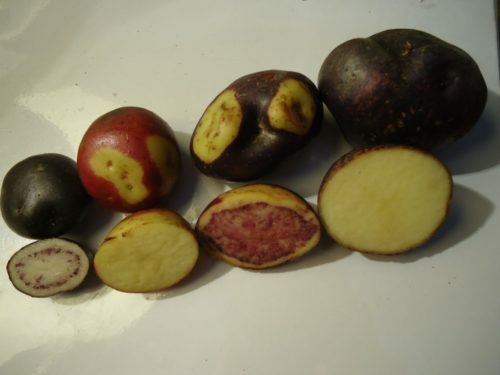 Rubas are small potatoes, also called “smooth potatoes” or “ñucos”. They come in two varieties, one of them yellow or green, and the other one red, Cantalicia tells us. They are a bit juicier than a potato and can be used, for example, to make spicy sauces. Cuibas are similar to carrots, and very nutritious. They can be used in salads, soups, juices or even eaten raw. Mashuas are spicy, and mostly used in sauces, and they are said to be good for those suffering from diabetes. Their leaves can also be used to make tea or infusions. The isolation of Gavidia, coupled to the fact that the producers do not own a truck that would allow them to take their produce to markets, leaves them at the mercy of middlemen when they need to sell part of their crops. These intermediaries come with their trucks and effectively end up fixing prices that allow for huge profit margins when re-selling later on. In spite of this, the isolation is being broken little by little. On one hand more and more farmers are becoming aware of this experience and coming over to acquire native potato seeds, thus extending its production. And on the other hand, initiatives of organized distribution and consumption are also springing up, allowing for a bigger protection against intermediaries, for producers and consumers alike. 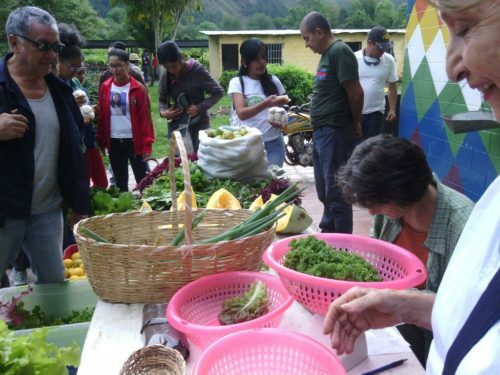 The “Mano a mano, agroecological exchange” collective, like other initiatives throughout Venezuela, has a component of direct organization of producers, which includes the Vertentes de Agua Viva cooperative, in order to sell produce directly to people at fair prices. More than that, it is a market that looks to boost native foodstuffs that had been forgotten, as well as encouraging producers to switch from conventional agriculture towards agroecology. However, the worsening of the crisis – Cantalicia says – also affects the regularity and reach of this kind of initiatives. When we discuss rescuing native seeds, it is important to point out that (imported) genetically modified seeds have two fundamental problems.1 First of all, there is the fact that it is impossible to reproduce or reuse the seeds, since they have patents, which leaves farmers totally in the hands of multinational corporations such as Monsanto (now Bayer), who acquire monopolistic positions in the market. Secondly, and this is related to the previous issue, the use of genetically modified seeds also requires the use of herbicides such as glyphosate, which carry deadly health and environmental effects. In this sense, the seed law approved in December 2015, after a process of tremendous mobilization and popular organization, was an important step to lay the bases for a model of ecological agriculture that would allow Venezuela to safeguard its food security and sovereignty. The experience in Gavidia is, so to speak, a little seed in this journey. It is not a matter of glorifying a model of subsistence farming, or yearning for an idealized and glorious past, but of understanding that food sovereignty, as an essential element in any emancipation project, requires control over the entire production chain, and this naturally starts with seeds23 The challenge is to strengthen and articulate these kinds of experiences, joining a bunch of remote corners in a stream of dignity and popular power. • Special thanks to Silvana Solano for having come with us to Gavidia and for her comments and suggestions on the article. Ricardo Vaz writes for Investig’Action. Read other articles by Ricardo. This article was posted on Thursday, July 12th, 2018 at 5:20pm and is filed under Co-operatives, Food Sovereignty, Food/Nutrition, GMO, Land ownership, Land Use, Venezuela.